Students of Delft University of Technology have developed a new add-on for a 3D printer that can cast silicones inside a 3D printed shell during the printing process. This new, and cheap, technique can be used to create new soft-robotic products that were previously impossible to make. The team presented their findings yesterday, at the science fair that marked the end of the minor Advanced Prototyping of the faculty Industrial Design Engineering. The technique they developed is called UltiCast. “It is a combination of moulding and 3D printing”, explains Max Nobel, student Industrial Design Engineering. “The machine makes a plastic shell, which is filled with 2-components silicones at the same time.” The shell is made of a plastic (PVA) which dissolves in water. 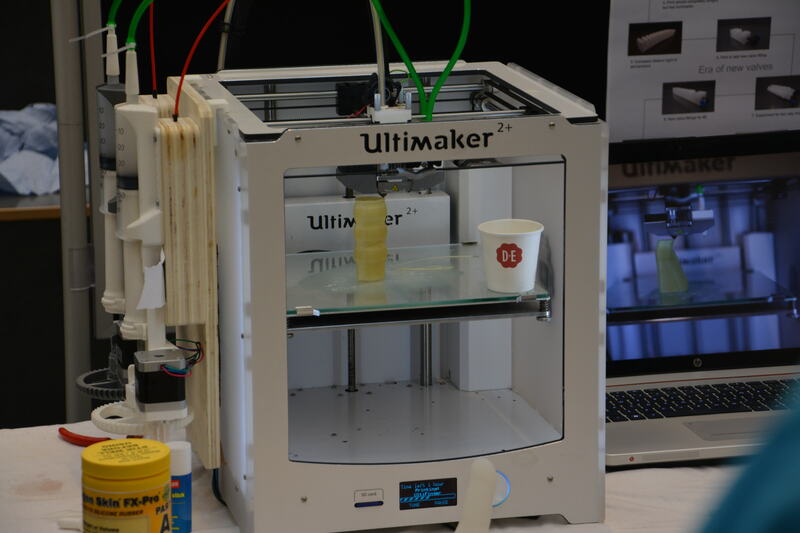 The team uses a Ultimaker 3D printer, which they completely rebuilt. UltiCasting will allow more complex shapes that could not be printed on a ‘traditional’ direct drive 3D printer. If the mould quality is high, the surface quality of the flexible silicon will also be very high. This is very hard to achieve in traditional fused deposition modelling (FDM) printing, because every layer of hot filament deforms the previous layers of filament. The new technique proves very interesting for soft robotics. With UltiCasting it becomes possible to ‘print’ a soft actuator in a mould, thereby elimination the manual casting process and doing so speeding up the process of creating soft actuators. “You get a lot of freedom to personalise the behaviour of robots with geometry and materials”, tells team member Rob Scharff, a PhD student in soft robotics. In the field of soft robotics, cheap 3D printing can prove valuable for several applications. This could be the case in the medical sector, especially with aided movement. “Reducing the cost of treatment and support utilities is a goal that inspires us all. Soft robotics could, in the long term, be a big player in this progress”, the team states. 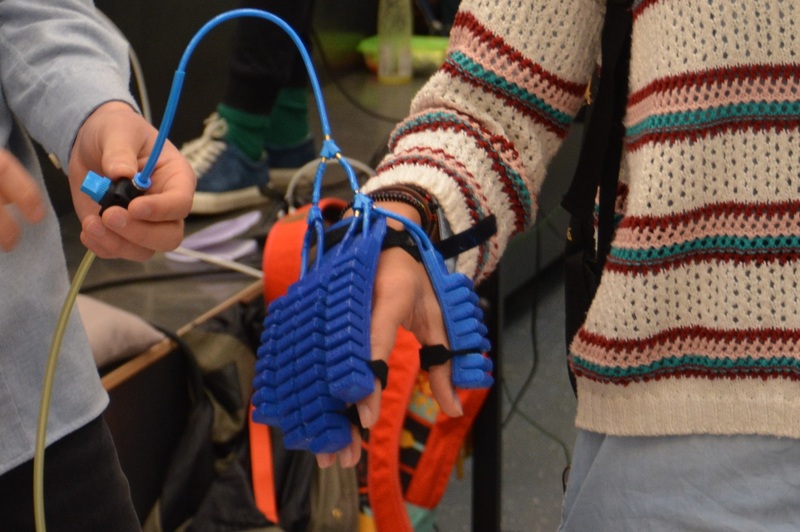 Therefore, they developed a 3D printed glove with soft robotics actuators to help move your fingers. This glove could be used to assist people with arthritis, local paralysis, limited hand function or as supporting tool in rehabilitation. The goal of the team is not to create a finished product, however, but rather to give a proof of concept showing the possibilities of 3D printing for soft robotics.